Share "How to Switch a Tank From Freshwater to Saltwater"
Keeping fish can be a rewarding hobby, and when many aquarists first get started they often stick solely with freshwater tanks. Freshwater aquariums are simpler, less expensive and easier to care for, but as your experience grows, you may find yourself more and more tempted by the diversity, colors and exotic appeal of a saltwater aquarium. Fortunately, when you are ready to switch from freshwater to saltwater you don't need to buy a new tank – if you know how to convert your existing tank correctly. Freshwater and saltwater may both be aquariums, but they can be worlds apart in the care they require, the equipment they need and even the vocabulary to describe them. If you don't know anything about live rocks, protein skimmers, de-ionization, salinity or specific gravity, it is best to study up before you plan to switch your tank. Consult with experienced saltwater hobbyists, check out books and websites and learn as much as you can so you feel confident with the new environment you are about to create. The more you study, the more you'll also realize that much of what you've learned from keeping freshwater fish will be the same – balancing the tank, providing good habitat and caring properly for your fish are all the same basic principles no matter what type of tank you have. 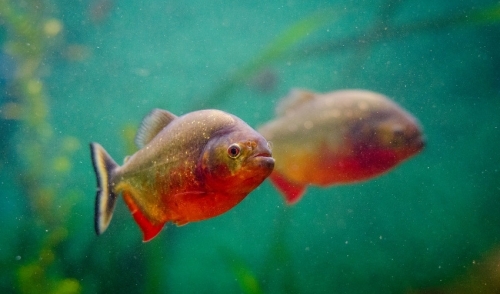 If you don't plan to continue keeping a freshwater tank, you will need to get rid of your fish. You can give them away to other hobbyists, schools or similar facilities, or you may be able to sell some healthy, unusual fish. Your local pet store may also accept the fish either for a small purchase price or store credit that you can use when setting up your saltwater tank. Completely drain your tank and empty it of all decorations, plants, gravel and other accessories. This is a good time to scrub and disinfect the tank to be sure you won't accidentally introduce any harmful elements to a new saltwater system. Most plants and decorations won't be used in your saltwater tank, so you may consider selling or repurposing them elsewhere. The lighting conditions are different in freshwater and saltwater tanks, and you will want to switch to different lights to highlight your saltwater tank. The right lighting will not only clarify the water color, but will illuminate the stunning colors of saltwater fish and corals. The right lights can also help promote beneficial algae growth in your saltwater tank. Saltwater tanks do not generally use gravel, and instead a substrate base of sand provides good filtration and a stable surface for your tank. Rinse sand before adding it to be sure there are no harmful elements or chemical contamination that could unbalance your tank before you even begin. Saltwater aquariums require better filtration than freshwater tanks, and you will want to upgrade your filter to the best possible option for your tank's size and community, as well as your budget. A better filter will keep the tank clean and colorful, as well as protect the health of your marine fish, corals and plants. Filtered water is best to add to your tank, then add salt mix and test the water repeatedly until you have reached the desired salinity and specific gravity for the marine fish or corals you hope to keep. It may take several days and a bit of trial and error to get the water balanced appropriately, but moving slow will help you better understand every change you make. Live rock is the basis of biological filtration in most marine tanks, and will help you create a healthy, comfortable environment for everything living in your aquarium. It will take several days for your rock to adjust to your system appropriately, and you should check the biological balance daily to be sure it is stabilizing at the levels you need for the fish and corals you want. Once your tank is balanced and the ecosystem is active, it's time to add your fish, corals and plants. Start slowly, with species that are more forgiving and easier to care for, and let each new resident adjust and acclimate before you add more. Eventually you will learn all the details that make a saltwater aquarium challenging but also a delight to care for, and you'll wonder why you didn't make the switch much sooner.